Currently I am undertaking a Masters of research in visual arts practice at IADT Dun Laoghaire. The premise for my research Masters project has been to use the imaging data gathered using an Atomic Force Microscope (AFM) to develop cellular landscapes and worlds. For this interdisciplinary research project we want to utilise the VLab as an experimental space for trying and testing the different cellular worlds we develop using the data gathered from an atomic force microscope. VLAB is a cube-shaped structure of 3X3X3 metres that allows in-depth 3D experiments and prototype developments. It is a real time interactive visualisation projection system governed by user position and movements. The projection system renders and synchs 3D stereo graphics, tracks users based on infra-red optical signals, programs 3D scenarios/worlds using python and plays ambionic sounds. 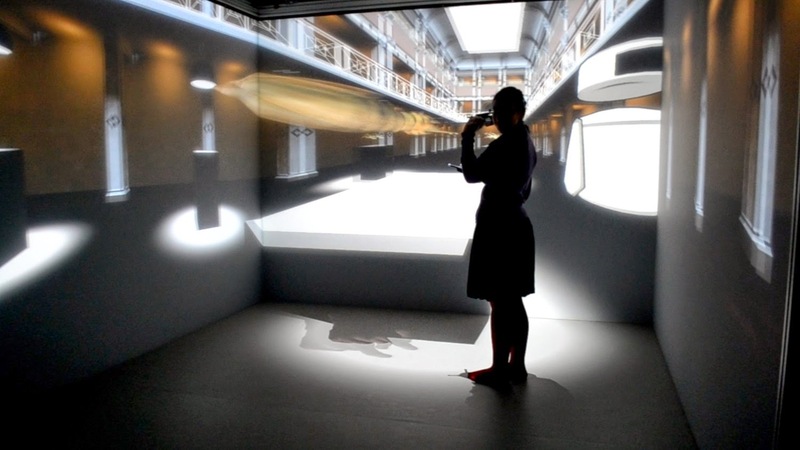 This is an image of a fellow Masters student at IADT using the VLab.